This Peruvian restaurant, which overlooks an archaeological site, was designed by Lima-based Estudio Rafael Freyre as a laboratory and hub for experiments in local gastronomy. 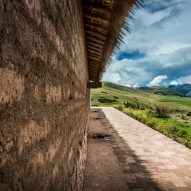 To create Mil Centro, Estudio Rafael Freyre overhauled a building in the Sacred Valley of the Incas, located in Peru's Andean highlands. 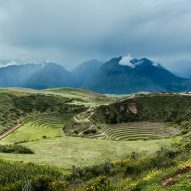 Twenty-three miles from the city of Cuzco, this area once formed the heart of the Inca Empire – a pre-Columbian culture tribe established in the 1400s – and is home to archaeological sites including Machu Picchu. Estudio Rafael Freyre's restaurant is set on the edge of one of these historic Inca developments: the Moray Archaeological Complex. Featuring huge circular, stepped paths, the site is believed to have been used for agricultural research. This history is apt for Mil Centro – a gastronomic project led by Peruvian chef and restaurateur Virgilio Martínez, which serves diners a tasting menu made with indigenous Peruvian ingredients. Martínez – whose Central Restaurante in Lima is celebrated as one of the world's best – will grow many of these ingredients on site, following a farm-to-table ethos also used by Copenhagen's Michelin-starred Noma. 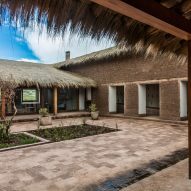 The building has a square-shaped plan arranged around a central courtyard, where an endangered Andean queñua tree grows. The layout creates four separate wings, hosting the restaurant and three research projects led by Martínez. Among these are Mater Iniciativa, which investigates the natural food resources in the Andes, and Flavour Lab Cacao, which experiments with cacao chuncho. In the micro laboratory, the team "ferments, distillates and macerated liquors based on local species". 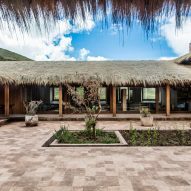 Following the Peruvian theme, Estudio Rafael Freyre's restaurant design takes cues from the traditional material and cultures used in the Andes. The aim was for the renovation to celebrate the history of the site, while remaining sustainable and environmentally friendly. "This architectural project ties into the local communities and brings continuity to the historical legacy of their traditions," Estudio Rafael Freyr said in a project description. "The restaurant merges into Moray's natural, cultural and social setting organically and respectfully." The building's roof is covered in woven Ichu Fiber grass. The foliage only grows at 3,680 metres above sea level – the same elevation as the restaurant – while its application is modelled on that used by the Incas for buildings and bridges. 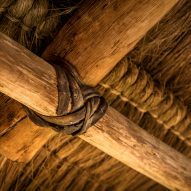 Underneath, the exposed roof structure reveals that portions of the grass are strung together, resembling hair tied in ponytails. Round wooden beams run beneath to form the main structure. Adjoining pieces are wrapped in leathery straps and fixed with nails. "The studio believes that engaging with this ancient technology will allow people to revalue the cultural landscape it represents, and experience the coexistence of different times," said Estudio Rafael Freyre. 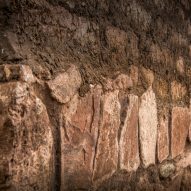 Earthen walls of the restaurant match the hue of the soil across the surrounding valley, and are the result of "extensive material research" undertaken by the architecture studio. To weatherproof the exterior, for example, the team devised a mixture of earth and resin sourced from a cacti to create a water-resistant barrier. Inside, the hallways are lined with a mixture of earth from various locations to offer different hues. "The predominant variations on white and grey evidence the diversity of tones and types of soil that exist in a single place," said the studio. 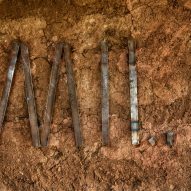 "Visitors to Mil Centro will recognise the history and ecosystems of the Andes through materials and techniques, such as local earth, fibres, minerals, weaving with Ichu Fiber, stone carving and finishes in adobe and coloured clays," Estudio Rafael Freyre continued. "It was important to showcase the close relation between materials, location, climate and altitude." Another key feature of Mil Centro is the stone entrance staircase, built by local artisans. On either side, the steps extend to form earthy terraces for planted produce, as a reference to the Moray Archaeological Complex nearby. 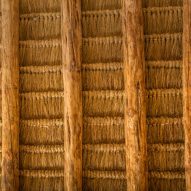 Employing local materials and resources, and the skills of native craftsman, Peruvian architecture is currently enjoying a moment under the global spotlight. A number of impressive new buildings in the country have receiving global recognition, including Grafton Architects' UTEC building in Lima received critical acclaim with the inaugural RIBA International prize in 2016. Homegrown talent is also prospering in the country, such as Lima-based firm Barclay & Crousse, which recently won the Mies Crown Hall Americas Prize for a university building in Piura. Studio founders Sandra Barclay and Jean Pierre Crousse credited the country's architecture boom to the amount of "tremendous freedom", in an exclusive interview with Dezeen. Photography and video are by Gustavo Vivanco.